The world-famous LEGO art exhibition has arrived in London! 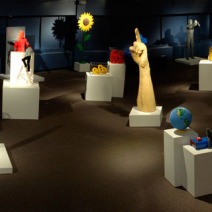 The Art of the Brick features eighty sculptures made entirely from LEGO bricks! Artists Nathan Sawaya spends weeks and weeks making the works from millions of pieces! There’s everything there from a huge LEGO dinosaur to brick-ified boys One Direction! The exhibition is only in the capital till January though so you better see it soon!